Snapchat is a mobile messaging app in which users can share photos or videos, known as “snaps”, via direct message or as a “story” that is broadcasted publicly to people they have added as friends on the app. Its distinctive feature is the “self-destructing” nature of snaps, allowing the recipient to only view the content for a limited duration (up to ten seconds) specified by the sender. Since its release in 2011, it has evolved into not just a messaging app enabling multiple communication methods, but it is also a platform for its media partners and brands to publish exclusive media or marketing content to users. As of February 2016, teenagers between the age of 18 and 24 make up most of Snapchat’s user population in the United States, according to Snap, Inc., the developer behind Snapchat. According to a survey conducted by the Global Web Index with over 3000 Snapchatters around the world, youngsters aged 16 to 24 make up almost half of the user population, making it the messaging app with the youngest user base. Between Snapchat’s private and semi-public communication features, users mainly use the app for its private chat function. In a survey by influencer marketing platform Social Soup, 95% of its respondents use the app for “communicating with friends”, while 63% share their stories. Compared with other social media platforms where user posts are archived on a personal feed, the kind of content Snapchatters send to friends are quite characteristic due to ephemerality. A University of Washington study on common usage patterns of the app shows that 60% of respondents primarily send “funny things”, such as stupid faces. Generally, they send more casual, in-the-moment content “that they might not otherwise send via a messaging platform that emphasizes archival rather than temporariness” such as Facebook or Instagram. 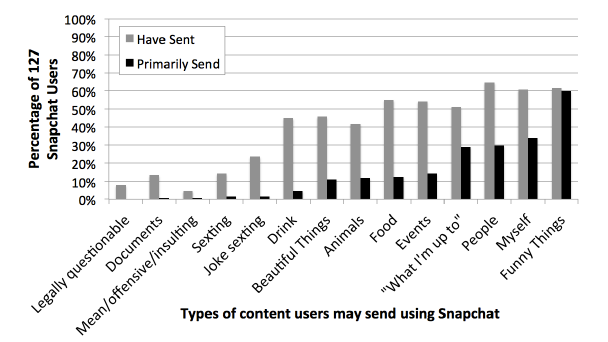 A UW study on common usage patterns of Snapchat shows that 60% of respondents primarily send “funny things”, such as stupid faces. Snapchat’s distinctive feature, the ephemerality of the snaps, may not appear as the main reason that’s drawing people to the app. When respondents were asked why, when they use Snapchat, they choose it over other services such as email, Facebook or Twitter, most said it is easy and simple (66.1%) and/or more fun to use (55.9%), UW researchers found. Upon opening the app, the camera is immediately activated and users can snap a photo with just a single tap (or in the case of video, holding the record button). The “friction-free” user experience makes it easy for people to share moments quickly, but at the same time makes space for the mundane with its default deletion feature and constraint which only allows sending photos taken by the Snapchat Camera (and not photos sitting in their Camera Roll). Knowing that content will disappear quickly and the fact that they must choose who they share the content with gives people the license to share more than they would in a more “permanent” medium. As participants in a Cornell research on the practices around ephemerality in Snapchat described, the app is “particularly well-suited for everyday talk”, i.e. “the mundane, everyday interaction between two partners”, which is what supports relationship maintenance because it helps to create a feeling of “interactional co-presence” even when partners are not physically co-present. Apart from its low-friction UX, Snapchat’s fun factor—applying filters to snaps, doodling over snaps, or applying lenses (augmented reality masks applied over a face detected by Snapchat’s Camera)—also draws people to the app. As a participant in the Cornell study said, “We have a thing where we send each other really, really ugly faces and we’ll do it a couple of minutes at a time. That’s really fun.” The researcher suggests that sharing enjoyable content, such as fun, humour, and creativity, is another key element in providing value to both parties in a conversation, especially in close relationship contexts. 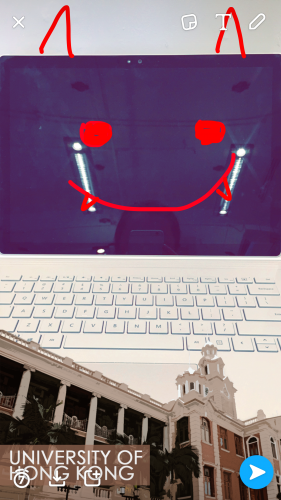 The fun factor that Snapchat provides, together with ephemerality, encourages users to be less self-conscious and more expressive in how they present themselves to familiar and intended audiences, as opposed to posts on many existing platforms which archive user content permanently, which can be elaborately thought-out, constructed, or edited for image management purposes. Snapchat has been disruptive because its ephemerality sets it apart from many social media platforms which automatically archives users’ digital objects. But this is not to say Snapchat has changed the way people socialize or communicate, because when telephones were the only form of communication available, human interaction has always been somewhat ephemeral—there was no way to relive, replay, or share a conversation with others. So what Snapchat has set out to do is to facilitate a form of communication that is closest to interpersonal interaction in real life in an age where most of our activities leave behind a digital trail. Because of its ephemerality and fun factor, Snapchat is capable of facilitating the communication of a wide range of human emotion— “not just what appears to be pretty or perfect” as how Facebook/Instagram users so painstakingly try to maintain on their profiles. The differences in content shared on Snapchat versus other social media platforms serves as evidence that the app is effective in its goals. The new form of communication that Snapchat has facilitated gives way to a higher-level discussion on digital ownership. On other social media sites, sharing and showing information overlap, and it is often unclear where digital ownership lies. The Cornell research concludes that with Snapchat, “ownership stays within both parties”, allowing users to engage in more intimate and self-disclosing interactions. The fact that most millennials use Snapchat on a daily basis for communication has made it easier advertisers, publishers, or public figures to reach this demographic of potential customers. It allows them to interact more “intimately” and “creatively” with their fans—showing exclusive and time-limited content, or allowing user submissions of creative doodles or selfies for online contests. 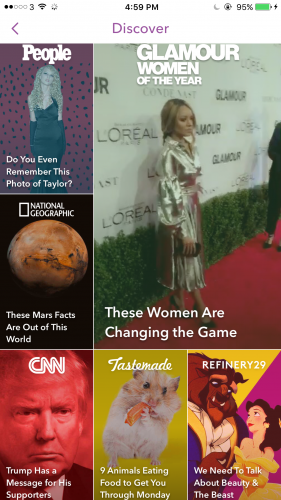 And because users know that media content will not last more than ten seconds on Snapchat, they tend to watch the entire video/advertisement, which fills the whole screen, making it easier for advertisers/publishers to get their message across without users being distracted from other content as on other platforms with crowded news feeds. 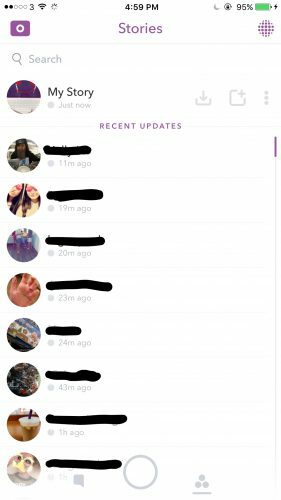 As of mid-2016, the Snapchat app has four main interfaces, Camera, Chat, Stories, and Discover. Navigation between these interfaces is mostly facilitated by swiping left or right. 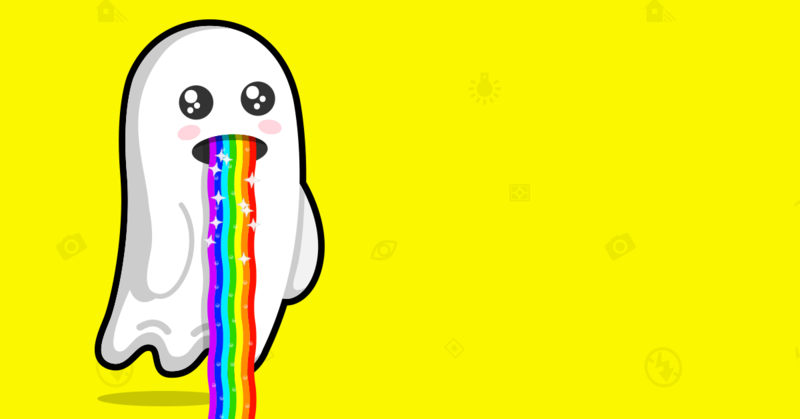 This interface is where the core features of Snapchat can be found. 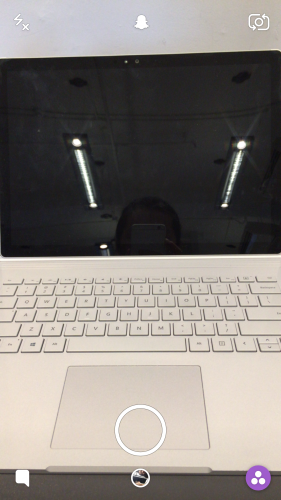 The Camera is activated once users launch the app. From this page, they can snap a photo with a single tap on the circle button located at the bottom of the screen, or record a video of up to 10 seconds by holding the button. Then, users can choose to edit the photo before sharing it with friends. They can overlay it with filters by swiping sideways, add emojis, stickers, text or a doodle using a colour brush by accessing the buttons on top. In the bottom left corner, they can choose the duration for which their audience can view their content. 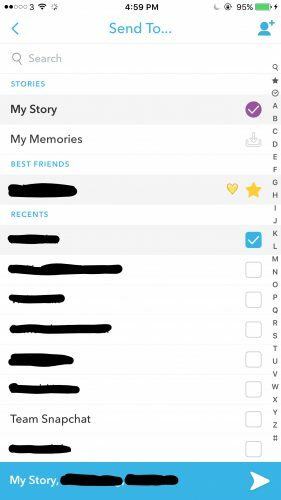 By clicking the blue circle with the white arrow on the bottom right, they will be brought to a page where they can choose which friends to send their snap to, and whether they would like to put it to “My Story”, where the snap will be available for 24 hours to all their friends. New snaps added to My Story will be appended to the end of the existing string of photos and videos in a user’s story. Users can access Chat by swiping right from the Camera or the app notification they receive when a friend sends a Snap/chat message to them. 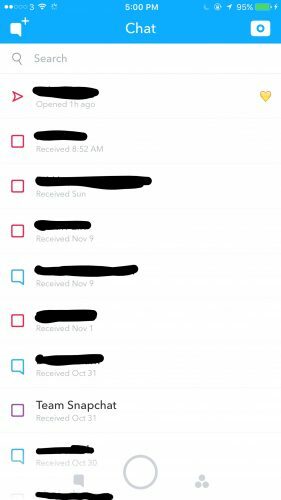 Although it doesn’t allow users to see a log of each conversation since messages self-destruct after they are viewed, it displays a list of friends in the order which they have most recently sent/received snaps to/from. Within each conversation, users can choose to do audio/video call, send text/stickers, or send photos from their Camera Roll. Stories can be accessed by swiping left from the Camera. It displays the public snaps posted by friends. Played stories will be placed at the bottom of the list, and can still be replayed within 24 hours of it being posted. Discover can be accessed by swiping left from the Stories page. Here users can browse exclusive content by 18 selected media partners. Each publisher’s content is also a string of snaps that can be traversed by tapping the screen, but unlike user stories, viewers will be prompted to browse more of the publisher’s content (e.g. full-length articles) by swiping up from a snap—and this is how Snapchat help publishers expose/drive users to the content that exists on the publisher’s own website without having users leave the app itself.